Made by Claire Carré, Longxiao Li, and me (ihavefivehat AKA Dennis Carr). Hold space or the left mouse button and move the mouse to tilt the level. 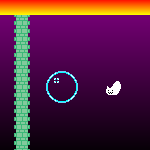 Get the ball into the glowing hole.